Petpets are usually cute little things. They look at you with their big eyes with their tounge out. All they usually want is a hug or scratch on the back of the neck. But when you are put in charge of lots of Petpets at the same time, now they act more annoying than ever. Why does mad old Mrs. Williams have so many Petpets anyway? You use your mouse for this game. You use the left mouse button to click on the Petpet and drag it to the place it needs to be. Every pet needs to be looked after, and any pet which isn't looked after either disappears or makes a mess on the floor. You have to respond to the Petpets wishes by seeing what their actions are and click and drag them into the correct area of the house. As demonstrated by the Feepit, this Petpet is showing that it is hungry. You need to drag the Petpet who is doing this action to the kitchen (the room on the left). This action is usually noticed by the Petpets tongue sticking out. It's easy to see, so should be easy to get it right first time. This Babaa is being a bit restless. Restless petpets really should go outside. Drag the Petpet who is doing this action to the sliding patio doors (the glass doors at the top left). All the Petpets have a different action for this, but it's quite obvious by the squeaking sound from them that they need to go outside. Like everyone else, Petpets get tired. All tired Petpets should go to the bedroom (Yes, they sleep in Mrs Williams bed!) and recover. The bedroom is the room in the top right of the screen. Like the Noil in this picture, it's obvious when they are tired, as 'Z's come out of them. If Petpets eat, it has to come out sometime! This Gruslen needs the loo, and fast! Drag the Petpet doing this action to the bathroom (the area to the right with the curtain). Petpets that need to use the bathroom are usually shaking. Life isn't always great for a robot. They break down. 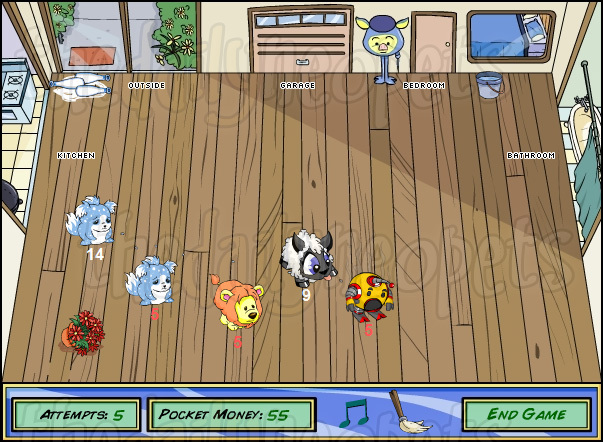 When a Petpet has smoke coming out of them, you need to drag them into the garage located at the top of the screen. It's mad old Mrs. Williams idea to have a garage in her living room, not mine! Just remember, this action can only be done by GX-4 Oscillabots and Roderie 1000s. Also, those Petpets only do this action. So you know immediately where these Petpets need to go. Petpets in vast quantities are going to make a mess, guaranteed. You lose 5 points for every bit of mess they make. Luckily, you can mop it up by clicking the mop icon on the bottom of the screen. It looks like the one to the right, so it'll be quite obvious. Also, mopping it up gets you 10 points. So, overall, you get 5 points for every mess they make! If you leave Petpets who need the toilet, they will make a puddle on the floor that needs to be cleaned by using the mop. As you play, the numbers of Petpets increase. As they increase, so do the amount of demands you have to deal with and you will get less and less time as the game goes on. My advice is to do any that have red numbers underneath them first. If there isn't one, just do the one that is closest to your cursor to be time effective. The old "Play in small mode" dilemma applies here. The smaller the window, the quicker you can move from petpet to petpet. But, like any other games which this could be a good idea, it will be harder to click each petpet and could make you worse rather than better. Play at whatever resolution you like and feel comfortable playing at. This game is all about reactions and time management. If you have slow reactions, or a slow computer, we suggest you play another game. What a surprise. The Phantom Orange Shirt Guy appears in this game. On the game start screen, click the spot above the Feepit's left eye. If the cursor changes to a hand, then you have the right spot. Click it, and he'll pop up in th bed they're sleeping in for 5 seconds. Everybody loves Petpets, but when they rage a house in there numbers, they aren't so cute and cuddly. Keep on your feet, don't think you've got nothing to do, as there is always something, like cleaning up their mess. You may not think you have a decent score, but you can get a decent amount of Neopoints from it compared to other games. Now go earn some pocket money!